14" Deep 4 Shelf Starter Units - Chrome - 14" x 72" x 63"
→ Olympic 14" Deep 4 Shelf Starter Units - Chrome - 14" x 72" x 63"
Olympic 14" Deep 4 Shelf Starter Units - Chrome - 14" x 72" x 63"
Olympic Storage Company is a producer of high quality storage equipment. 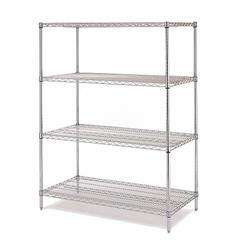 They produce chrome black and green epoxy wire shelving units, carts, and wall shelving units that are built tough at a reasonable cost. Available in a variety of sizes and shapes and accessories. Olympic Storage products are used in food service, industrial, healthcare, commercial, and other industries.